Single Rooms start at £30.00 per night. Double/Twin En-Suite bedrooms start from £60.00 per night. Room prices vary according to seasons. Breakfast is included in the above tariff. If the booking is cancelled less than 7 days before arrival or in the case of a no show then a charge equal to100% of the stay will be made. Payment will be taken from the card details supplied at the time of booking. In the event of a booking reduction (after arrival date) no refund will be given. A deposit is required within seven days prior to arrival to secure the booking or the booking will be cancelled. If any of Trevellis Guest House property is lost or damaged during your stay, you will be charged the full amount for replacement or repair. Payment would be due before departure or charged to the card details provided at the time of booking. In the unlikely event that we are unable to honour a booking, a full refund of all money paid will be made. We shall not be liable for further compensation. No allowance can be made for meals not taken, temporary absence or in the event of the accommodation being vacated before the expiry date of the booking. We operate all year round maintenance, changes and improvements are necessary to the upkeep of Trevellis, and may take place without prior warning. Whilst we will endeavour to keep inconvenience to a minimum, no compensation will be offered for facilities offered becoming unavailable fo all or part of a booking. Check in is between 2.00pm and 10.00pm on the day of arrival (unless prior arrangement has been made.) All guests must vacate their room by 10.00am on the day of their departure. Trevellis is strictly no smoking throughout, failure to comply will result in a £100 deep cleaning charge. You are responsible for the security of your belongings unless handed in for safe keeping. 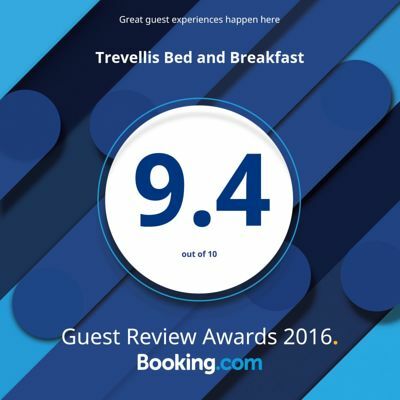 Whilst staying at the Trevellis we kindly ask that you respect your fellow guests, our staff, our property and all 3rd parties. Naturally, we want you to have a enjoyable holiday, however, this cannot be at the expense of anyone else. Should we deem it necessary to ask a guest to leave, his/her party will forgo all charges paid. Anyone found admitting non paying guests to Trevellis will be asked to leave immediately, and his/her party will forgo all charges paid. Under 18’s are usually allowed to stay at Trevellis – at the discretion of the management. Any guest under the age of 16 (on the date of arrival) must be accompanied by a Parent or Guardian. Any guest under the age 18 (on the date of their arrival) must either a) be accompanied by or b) have the written consent of: a Parent or Guardian. Any guest under the age of 18 (on the date of their arrival) that does not meet the conditions above will not be permitted to stay at Trevellis, and will forgo any room charges paid. All bookings for under 18’s must be made by a Parent or Guardian, or the Parent or Guardian of another member of their party. A Security Bond credit/debit card pre-authorisation must be made by the Parent or Guardian making the booking. You should bear in mind that Trevellis is an adult environment – guests are expected to behave like adults and to assume adult levels or responsibility. Under 18’s are not permitted to consume alcohol whilst on the premises. The Parent or Guardian making the booking must be available to collect any member(s) of the party, should we deem it necessary to ask a guest to leave. These Terms and Conditions may be subject to change without prior notice.